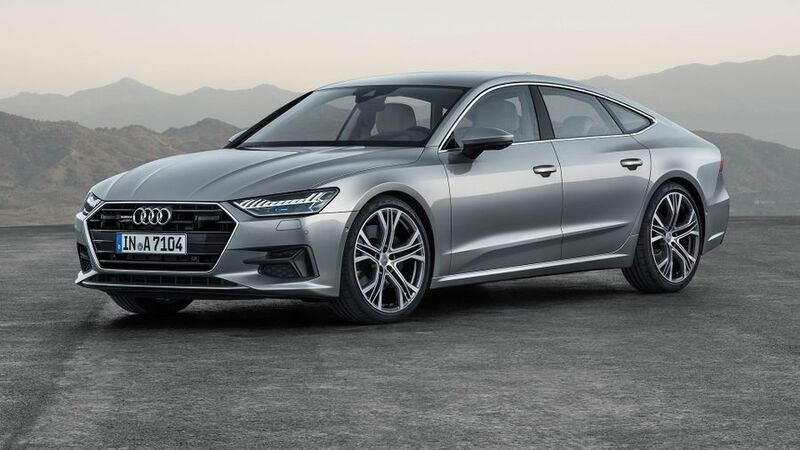 Audi says its new rival for the Mercedes CLS is a five-door coupe, with more space and more comfort inside than the old version, as well as a smoother ride, sharper handling and the very latest technology. This is the brand new Audi A7 Sportback. It's a five-door coupé with the sleek look of a grand tourer, and the more practical aspects of saloons and estates. And it's got the new Audi look, first seen on the new A8. So, the A7 has the new ‘Singleframe‘ grille – wider and lower than the Audi A8‘s – as well as narrow headlights and sharply sculpted air inlets below. It's almost identical in size to the model it replaces. And it's kept its pronounced sculpting in the bodywork over the wheels, while the profile of the car drops sharply towards the rear end, which incorporates a spoiler that extends automatically at 74mph and above. Like all of Audi’s top models, the rear lights are joined by a flat light strip, which flashes when the doors are locked or unlocked. There are 15 colour options, and S line models will have their own look The radiator grille and front air inlets, as well as the bodykit are all different, being trimmed in black and with stronger sculpting. Inside, the new A7 looks very similar to the new A8, with the same instrument panel and a centre console orientated towards the driver. The 10.1-inch upper display is designed to almost disappear into the dashboard when the car is switched off. The previous A7’s rotary controller has now gone though. Instead, the driver accesses everything through two large touch-screens. The upper screen runs the infotainment system, while the smaller lower display looks after the climate control system and comfort settings. This screen also allows the driver to ‘write‘ commands, with the automatic gearbox selector deliberately designed to allow the user to rest their wrist on top of it while doing so. A head-up display that projects information onto the windscreen is an option, as is voice control, while the top infotainment system includes the fully digital Audi ‘virtual cockpit‘, which replaces traditional dials with a customisable digital display. Compared to the previous A7, this new model is said to be more comfortable and spacious inside. The top-of-the-range seats are multi-adjustable, and come with ventilation and massage, while there’s better head- and leg-room in the back. The panoramic sunroof has also been redesigned to allow more light into the cabin, while the air quality package improves interior air quality by using subtle scents, an ioniser and a filter. The boot space – 535 litres, expanding to 1,390 litres with the rear seats folded down – is the same as on the old car, but Audi says the boot now allows two golf bags to fit horizontally – in addition to the optional spare tyre. Next year, Audi will introduce an ‘AI‘ button, which will include the remote parking pilot and the remote garage pilot systems. These will allow the driver to manoeuvre the A7 into and out of a parking space or garage, and they can even do that through an app on their smartphone from outside the car. There are a massive 39 driver-assistance systems available on the new A7. Audi says the new electronic chassis program (ECP) and the updated air suspension will make the new A7 more comfortable than the old car, and help it to handle more sharply. The car will also be helped by optional dynamic all-wheel-steering. At low speeds, the rear wheels turn slightly in the opposite direction to the front wheels, making the car easier to manoeuvre. At 37mph and above, the rear wheels turn in the same direction as the front wheels, making the car more stable and composed, as well as helping with lane changes on the motorway. Buyers can also choose between four suspension set-ups: a conventional steel spring suspension; the sport suspension that lowers ride height by 10 millimetres; electronically controlled damping; and the self-levelling adaptive air suspension. To improve fuel consumption, all A7s will have a new ‘mild hybrid‘ system. This allows the car to regenerate the battery under braking, as well as to freewheel at speeds between 34 and 99mph, with the engine deactivated. At the same time, the start-stop function has been significantly expanded and now activates at 13mph, with the car restarting from a standstill as soon as the vehicle ahead begins to move. 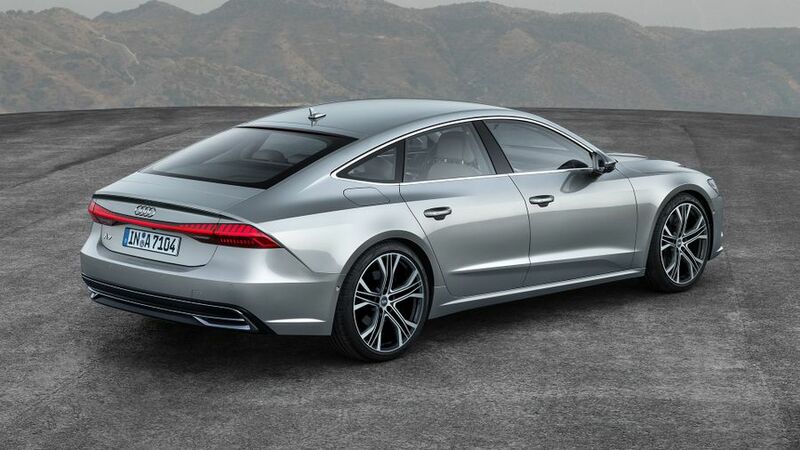 To begin with, the new A7 Sportback will be available only with the turbocharged 3.0 V6 petrol engine and a seven-speed semi-automatic gearbox, which powers the car from 0 to 62mph in 5.3 seconds and on to a top speed of 155mph. In the official tests, it averages 41.5mpg and emits 154g/km of CO2. More engines, both petrol and diesel, will join the range further down the line. The new Audi A7 Sportback will be available to order from early next year, with prices for the first phase of models expected to run from about £56,000. Interested in buying an Audi A7?